Preheat oven to 350. Heat an 8-10 inch oven-safe frying pan with olive oil on medium heat. Add spinach and a couple of pinches of sea salt. Cover and cook until wilted. Add garlic, remove the lid, and continue cooking until most of the liquid from the spinach evaporates. 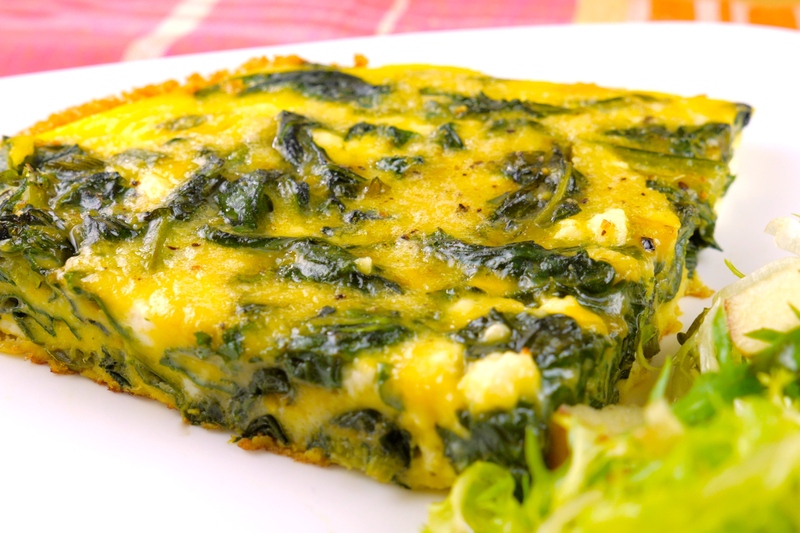 While the spinach is cooking, beat the eggs. Add the ricotta cheese, thyme and basil to the eggs and whisk. Put 2 tbsp. of butter (or olive oil) into the pan with the spinach. When the butter melts, add the eggs and ricotta cheese. Season with sea salt and freshly ground black pepper and cook on the stove top for 2-3 minutes. Place the entire pan into the oven and bake 10-12 minutes. Remove from the oven and let sit for 3-4 minutes. Serve with your favorite salad!